Ok, I'll admit it. I'm afraid of the dark. There's something about knowing that some monster, or the disembodied spirit of bygone teenager, may be lurking under my bed. Waiting for the right moment to pounce after I drift off into sleep. Well, with the latest addition to my arsenal my fears have finally been alleviated. Sort of. 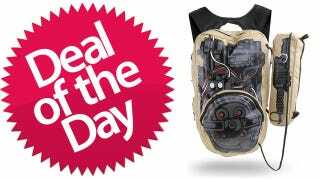 The Ghostbusters Proton Pack Backpack has the look of the real thing, but it's just a backpack, so you can store whatever you want inside it—including ghosts. Or books and pencils and stuff. That works, too.